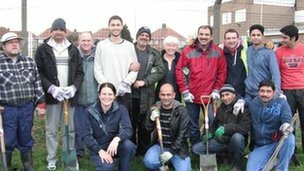 A group of Muslims in Hartlepool have helped to plant 450 trees in their home town. It is the latest volunteer project undertaken by the members of the Ahmadiyya Muslim Youth Association. Members of the group give up their free time every weekend in an attempt to improve the society in which they live. Sheraz Kasi, a spokesperson for the group members, who worship at a mosque in Turnbull Street, Hartlepool, said the tree planting had been done with the Wild Green Spaces in Hartlepool project team. The shrubs were planted in West View Cemetery. Share the post "Ahmadiyya Muslim Youth Association helping Hartlepool"